>>! Watch out ! All the sales start at 11am EDT! 2nd of February: Release of the Custom Bamboo Kimono + Chic Ranger Ponytail, in Mystery Boxes and Direct Sales. 3rd of February: Tachi Day - All the tachis in Direct Sales and with discount prices + Packages of the new Sakura and Frozen Tachi with Weapon Fortification Scrolls. 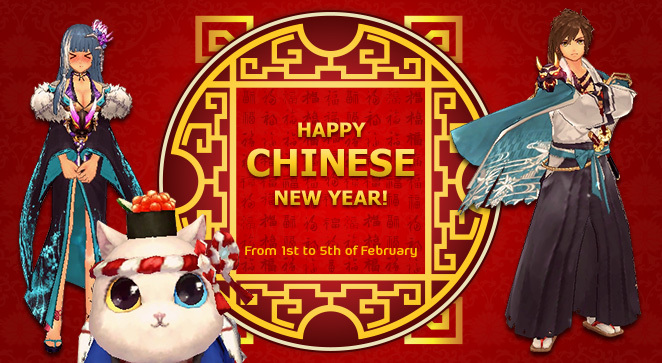 5th of February: Chinese New Year! – Sushi Master Cat Gold Mount Package! 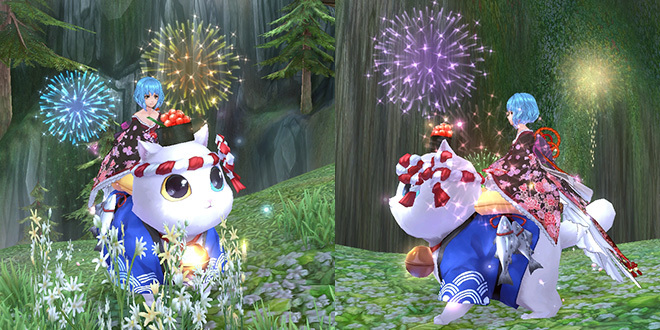 From 1st to 5th of February: You might find the Sushi Master Cat Gold Mount in the new Mystery Boxes! Make sure to charge AP in advance! Let´s all celebrate the Year of the Pig together!! Remember the cute Bamboo Kankos back costume? They visited us during Christmas… but they wanted to stay! So they got smuggled between the boxes and here they are again! Become the ultimate Samurai with the Bamboo Kimono! Try your luck with the Mystery Boxes … or get one of the limited packages! Tachi day! Get the sharpest blade into your equipment! All the Tachis on Direct Sale! From 499 AP! Limited Quantities. And don´t miss the Special Packages of Phoenix Red Katana and Thunder Dragon Katana… these packs also contain Ruby Coins and even Fortification for your Weapon! Izanami, the Lady of Styx, and her demons didn´t want to miss this party… so they will “let you” look like her with the Izanami Hairstyle! Find it on Mystery Boxes, Fortune Chests… or in the limited Ultimate 3 Star Izanami Pack! And our most special guest of these Celebrations… the Master of Ceremonies… the gold Mount Sushi Master Cat!